Golden Software, a developer of software for data visualization and analysis, has released Version 14 of the Grapher scientific graphing package with new plotting and customizing functionality. Available today, Grapher 14 is downloadable by all users with active maintenance agreements. A preview version of Grapher 15 is now available, giving active users pre-release access to new fit curve and statistical plotting capabilities. The Grapher software gives users deeper insights into their data by providing them with 80 flexible and easy-to-use 2D and 3D graphing tools for plotting, analyzing and displaying scientific data sets. The package is used extensively by scientists and engineers in oil & gas operations, hydrologic/geochemical studies, environmental consulting, mineral exploration and academic research. Enhanced Plotting – Ability to plot data in rows and columns, perform one-button Durov class plots, and easily generate multi-plot reports. Improved Bar Charts – Bar charts are more versatile, offering variable bar widths and differentiated fill colors for negative and positive. Axes Upgrades – Break Axes are enhanced so users can customize the break mark and add a break distinguisher to the plot itself. 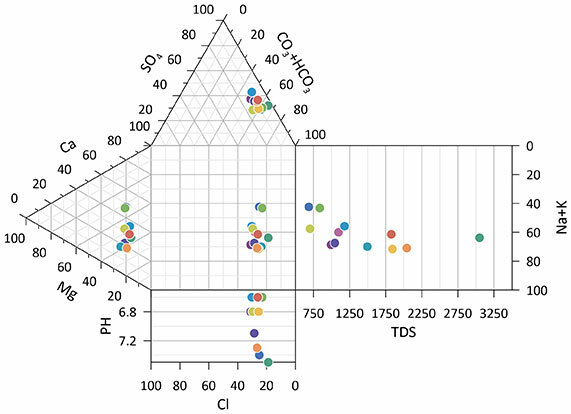 Ternary plots have also been upgraded to enable users to rotate the axis direction, a useful option in geochemical analysis.